As the holidays come to a close, and the weather forecast uses expressions like “wintery mix” and “Arctic air” with increasing frequency, it’s understandable for you to lean a little cozier than normal in your wardrobe. But spending the majority of your off-duty time in the same gray sweats isn’t good for business either. (And by business we mean your mental state as well as your ability to get a date.) Luckily, in 2018, it’s easier than ever to put together an outfit that is as sharp as it is comfortable thanks to the popularity of down outerwear, jogger pants, luxe sneakers, and other off-duty staples. Here, three stylish looks for three different lazy-day situations. 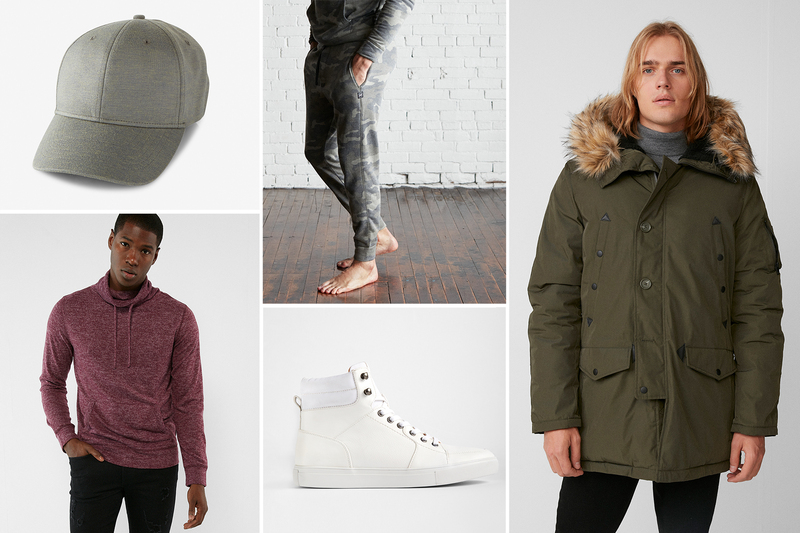 Make sure you’ve got these style bases covered and you’ll be set for the winter. Just don’t forget to change back into your suits and business casual finest come Monday morning. Our sweats can do a lot but they can’t get you the corner office. Sorry, fellas. When your agenda involves hitting the gym and running errands, you need a look that’ll feel as at home on the mats as it does your local taqueria. Compression tights and workout shorts are the functional bottoms you need for a workout. Throw a sporty hooded sweater on top of your T-shirt to elevate the look for post-workout stops. A shot of color will also take your fit from boring to bold in an instant. We love a bright red puffer coat for the sartorial equivalent of an adrenaline rush. When you find yourself too busy running errands instead of your cardio routine—or are just feeling too chill to possibly break a sweat—it’s all about a cozy sweater and a pair of jogger pants. Our side-stripe joggers have just enough tailoring to look polished, and just enough roominess to be super comfortable. Grab a pair of gray high-tops and a coordinating gray beanie, then throw on a black varsity jacket and a scarf to elevate the fit further. Hey, you never know when a grocery run could turn into an impromptu date. Elevated sweats are the key from getting from point A to point B in style and comfort this season—whether you’re navigating airports, highways, or packed parking lots. Our camo print jogger pants and plush jersey funnel neck pullover look like a million bucks and feel like pajamas. 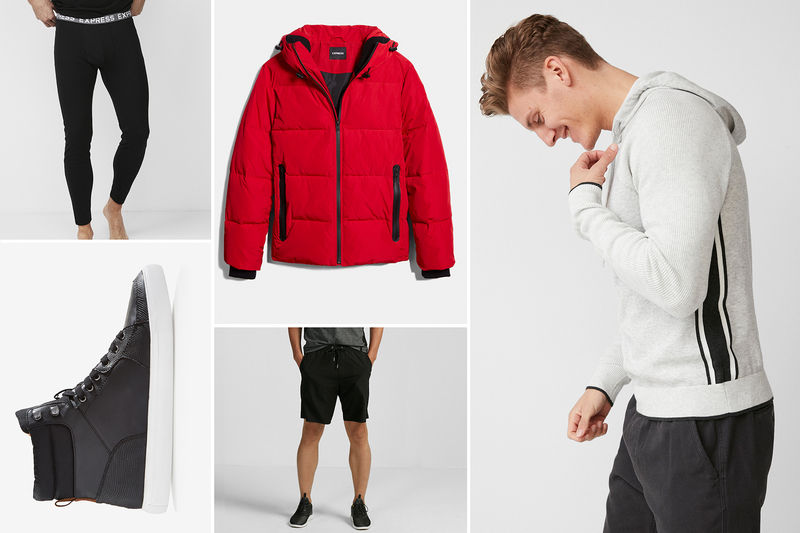 Throw your warmest parka on top as the down comforter of your outfit. Then finish the look with some optic white high tops and a baseball cap for a sporty vibe that’ll give the whole thing a polished and unified feel.